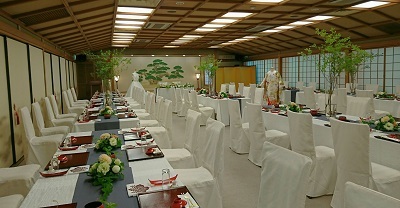 “Jurakuden” : In this spacious room, a large number of guests can be seated at the table and chair settings. 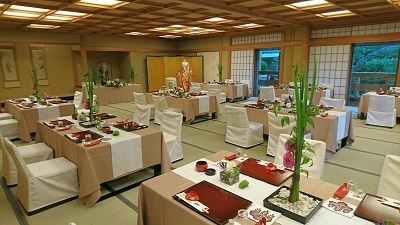 “Seifuden” : A well-lighted room in where table and chair setting is also available. 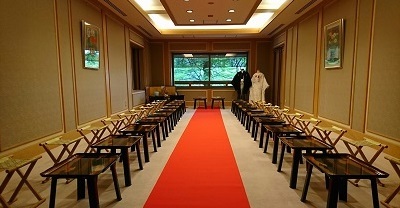 “Choujuden” : Chakonshiki(=wedding ceremony conducted in a spirit of Japanese tea ceremony) in Ryurei-style is available. We held a bridal fair at Saami (ryoutei restaurant) on August 5th. We appreciate that many guests attended the fair in spite of the summer heat. It is our 15th year since LST started holding bridal fair at Saami twice a year, in summer and winter. Some of the guests left following comments. All the LST staff really appreciate that we have been given precious opportunities to plan the weddings at such a historic restaurant like Saami. We will continue to provide our best service to each couple to make their wedding day a special one. We would like to thank the guests who visited a fair, Saami and other business partners.